Click on the link above to download Apache Directory Server for your Linux architecture. Double-click on the installer to open it. You might be prompted to enter your root password. 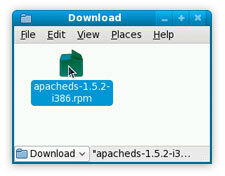 A recent Linux distribution supporting the *.rpm install packages.